The European ground squirrel is a small mammal which is endemic to Europe and in continuous decline across the entire distribution range. In 2013 we have conducted 872 quadrants surveys in order to establish the species density, distribution and habitat selectivity. During the field research we found out that the species’ major threats are pasture degradation and built up areas. In order to start the conservation measures and because the species ecology is poorly known, we conducted educational and awareness-rising activities in 75 schools, one in a university and three exhibitions in Iasi, Bucharest and Tulcea. 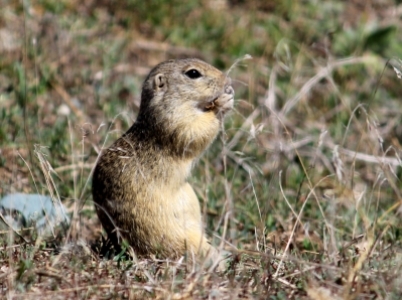 Because the European ground squirrel is not a priority species for the Romanian environmental authorities, as it is for the European Union, we have conducted meetings to discuss the conservation measures. We established contacts with the environmental authorities and we collaborated with them for agro-payment measures which will contribute significantly to the protection of the species habitat. The project results were integrated in a scientific paper that has been published in the European Scientific Journal and the first book regarding this species, for Romania. The project results were also presented at the Global Multidisciplinary Academic Meeting, 27 – 30 March 2014, Praia, Cape Verde.